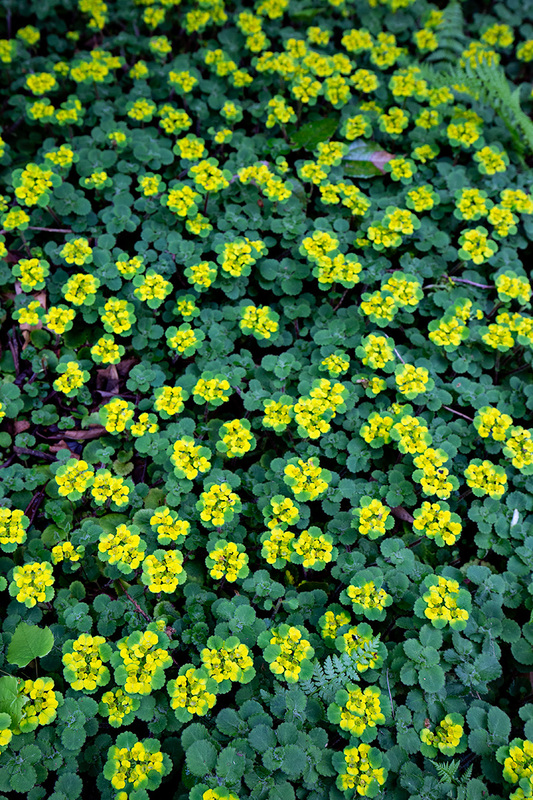 First planted in UBC Botanical Garden in 2012, patches of David’s golden saxifrage can now be found here and there as a groundcover throughout UBC’s David C. Lam Asian Garden. The golden colour is particularly evident in the early spring, due to a combination of the new leaves, the flowers, and the higher intensity of light reaching the forest floor before the trees fully leaf out. Native only to western China, Chrysosplenium davidianum is a species of “shaded and wet grassy places in forest understories, rock clefts in ravines”; at UBC, it is typically grown underneath rhododendrons. The particular patch in today’s photograph will sometimes be littered with the fallen corollas of a purple-flowered Rhododendron concinnum to poetic effect–I’ve yet to adequately photograph this, though. Wikipedia notes somewhere close to 60 species of Chrysosplenium have been described. Most are native to northern parts of the Northern Hemisphere, but 2 species can be found in South America. Back from Chile–photos from there will be delayed in being shared, though (long story short, I don’t have access to my computer to process them due to renovations). Hum, wanna see those pictures… Welcome back, Daniel. P.S. : As I said other times, there should be something like a bell button to send us a message telling someone replied, I think it would be better to join the discussions; otherwise I always have to come back here. I’ll work on getting that installed. Amazing photo and an amazing little plant. Welcome back Daniel, looking forward to the Chilean photos! Welcome back Daniel, looking forward to the Chilean photos as well. This Chrysosplenium is very pretty, how hardy is it? That would look lovely in my garden. I’ve seen it mentioned on sites as hardy to 7A (presumably USDA 7A), but given its habitat of rock clefts in ravines (likely at the upper limits of its elevational range, of 4100m or 13500′), I suspect it is a lot hardier. Or, at least plants from that particular provenance.